Create bindings for controllers that didn't exist when the game was released. With the latest beta version of SteamVR Valve is now testing a new setup for controllers that makes things more customizable no matter what controllers you're using, what the game was designed for, or what capabilities the user has. 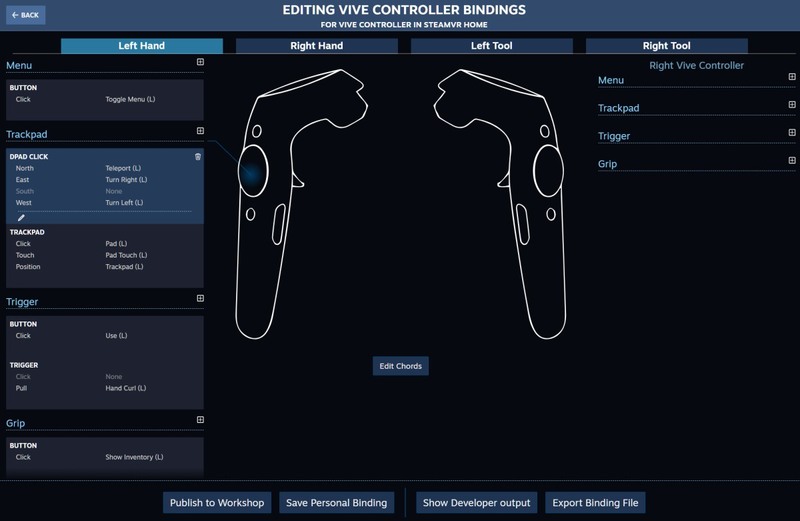 With the new SteamVR Input system, developers are now able to offer alternate control schemes without updating the game itself, while gamers can adjust bindings for buttons and switches to their liking, then share those setups via Steam Workshop. Better yet, you don't even have to leave VR to change things around, since the settings menu is available in-headset. According to Valve, hardware makers will be able expose what their controllers can do to the system, with information available on Github about how to get their drivers set up to take full advantage of the new input capabilities. Hopefully, it should let gamers adjust third-party controllers like the Vive controller in ways similar to the native Steam controller, and open the playing field to more hardware going forward.